Securing large organizations is a massively complex task. There are so many different domains of security to think about, it can drive a person crazy. Fortunately, as we work closely with our customers and partners, we have the opportunity to see and address many of these challenges. We share what we learn with the security community to show them how to think about identity and access management (IAM) and network security in a unified way to get more out of each solution without incurring more cost. We are on a mission to help CISOs open their very own “Department of Yes.” The goal is to help them see how IAM and network security can be business enablers. For example, with Dell IAM and network security solutions working together, a policy on the next-generation firewall can help enforce an application governance policy defined in the IAM solution. SonicWALL next-generation firewalls can be easily integrated with Dell One Identity Safeguard for Privileged Passwords to help tighten up security of the most trusted assets in any organization. Cloud Access Manager can consume data from the firewall to require elevated authentication. These are just a few examples of what we can do today and there will be more integration in the future that will help the CISO say yes more often. On Monday, Curtis Hutcheson, VP and GM of Dell Security Solutions discussed in his blog the importance of becoming the Department of Yes. Curtis discussed our new approach to IT security – Govern and Protect – where our network-aware identity solutions and our identity-aware network solutions work together to enable organizations to take advantage of better security with less complexity and lower costs. By becoming the Department of Yes, the security team can now easily embrace new, innovative initiatives such as moving to the cloud, BYOD, digital transformation, the internet of things and more. By governing every identity across the organization with our identity governance, privileged management and access management while inspecting every packet with our next-gen firewalls, secure mobile access, and email security, IT organizations no longer need to say no to supporting new strategic business initiatives. View this short video to learn more about how Dell Security enables CISOs to open their own Department of Yes. 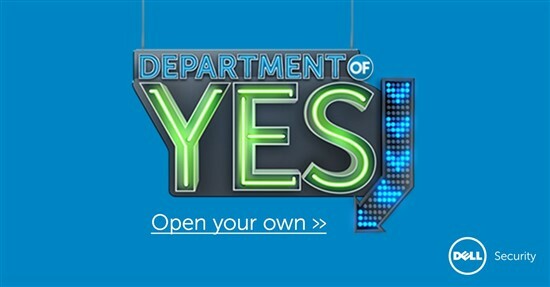 For more information on how you can open your own Department of Yes, be sure to check out this new Dell Security web site.